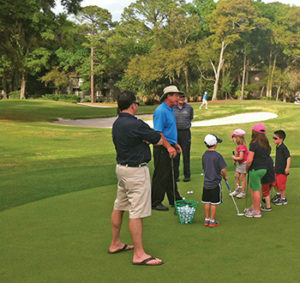 Today, more than 40 people from ages 3 to 95 will take golf instruction at Palmetto Dunes Golf Academy. 1. Golfers of every skill level will enjoy the exhilaration of the ball rocketing off the clubface and flying straight to the target. 2. An 80-year-old man will realize he can still play golf and experience the personal satisfaction of a well-struck shot. He can play proudly with his grandchildren. 3. A three-year-old girl will sing songs and learn she can putt the ball in the hole consistently from five feet. That child will be challenged to putt with her eyes closed. She will come to learn that even Helen Keller and Stevie Wonder can enjoy golf. 4. Families will play golf, and laugh and giggle as they experience success and failure together. Dad may even let the kids sit in his lap and drive the cart. 6. The husband is happy now because he gets an extra day of golf when his wife and kids are coming with him. Photo courtesy of Doug Weaver, Palmetto Dunes Oceanfront Resort. 8. The introverts can be by themselves and be challenged by golf, without needing anyone else to enjoy this interesting game on a beautiful day. 9. The hardworking professional who needs outdoor activity and doesn’t require a lot mentally or physically will be refreshed and energized by the best natural medicine: fresh air, big skies, light activity and personal achievement. 10. A “geek” will discover the similarities between golf and video games. Both require engagement and dexterity, have different skill levels and offer satisfying rewards. 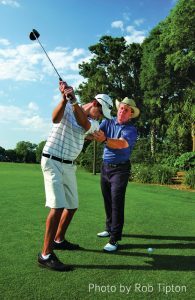 You are invited to take golf instruction so you can make your own discovery. Come join me on Monday from 4-5 p.m. at the Palmetto Dunes Oceanfront Resort’s Robert Trent Jones Golf Course. You’ll enjoy seeing trick shots and getting hands-on, interactive golf instruction. You may volunteer for a lesson or win a prize. No reservation is required, and it’s free. Make the most of every moment on the course this summer. I hope to see you for a golf lesson and out on the green!